The University of North Carolina at Chapel Hill has a well-known Liver Transplantation Program. 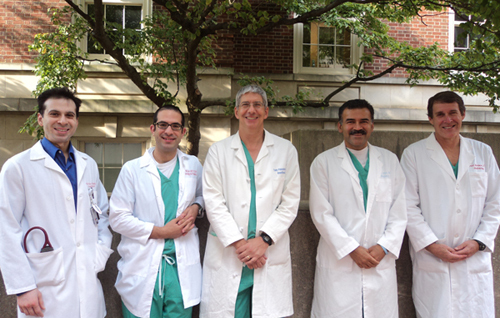 It includes five accomplished surgeons along with state of the art Transplant Hepatology resources. The Department of Anesthesiology has been an integral part of the program since its inception in 1991. All adult transplant patients are cared for by an excellent team with several years of experience in liver transplantation anesthesia. Currently, there are five dedicated faculty members on the team, including Dr. Harendra Arora, Dr. David Hardman, Dr. Robert Isaak, Dr. Tony Passannante, and Dr. Ravindra Prasad. Resident physicians and nurse anesthetists are actively involved in the care of all our patients. Liver transplantation poses many anesthetic challenges, and the patients that we care for bring a very wide variety of coexisting illness to the operating room. All patients are carefully reviewed in a weekly meeting by a multi-disciplinary team including anesthesiology. This enables us to deliver the best possible customized care to a high risk patient population. We are proud of the fact that despite their critical illness, our patients have an excellent 1-year survival rate of greater than 90%. Since 1991, we have performed over 800 liver transplant procedures, and we strive to continue this tradition of excellence.